Stepping Stones Learning Center’s classroom programs provide a unique learning environment for children with and without special needs. Of prime importance is the match of values and goals between families and staff. We are striving for an acceptance of diversity and learning variances for children and adults participating in the program. Positive adult relationships, along with rewarding experiences for children and low adult to child ratios (below state requirements) provide for a well-rounded program. It is our belief that this program will instill values, encourage enthusiasm and creativity and strengthen socialization while children are engaged in the activities and routines of a stimulating classroom. Enrichment activities including music and rhythm, creative art and dramatic play, encourage active exploration of the environment from the youngest crawling across the floor to the oldest investigating the world around him. We promote curiosity, individual interests, creativity, and the development of self-esteem. The child’s ability to be a competent individual, increasingly independent in action and thought is the overall objective. In conclusion, Stepping Stones Learning Center’s philosophy is to provide the finest possible environment for the safe, healthy development of young children. Our highest priority is on the development of self-esteem, confidence, and a love of learning. To provide a safe and nurturing environment. To be an effective early childhood program which is developmentally appropriate, child-centered, comprehensive, individualized and family-focused. To facilitate children having fun while learning to play with their peers. To stimulate the talents, abilities, strengths, and weaknesses of all. To respect and support all children in the context of their family, culture, and developmental needs. To be flexible and individualized when planning for communication, cognitive, adaptive, motor and social needs of children. To help children grow in curiosity, creative thinking and decision making. Integrated toddler classroom providing developmentally appropriate activities to reflect the interest of the whole child and develop his/her social, emotional, physical and cognitive development. For children 2 to 3 years old with or without special needs. Taught by a special education teacher with an assistant; speech pathologist also provides support. Parent involvement integral to child's overall improvement -- parents encouraged to be part of center-wide parent activities and may be asked to be parent helpers on as-needed basis. Speech therapy, occupational therapy, physical therapy, social work and special education services also available on small group or individual basis if need is determined. For children 24 months to 3 years old with developmental challenges who require significant time and attention from adults and has approval from Department of Health to receive services. Taught by special education teacher with assistant and speech pathologist. 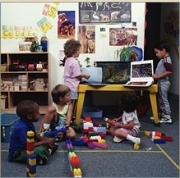 Classroom environment utilized for therapy as a natural setting for speech and language development and for more consistent generalization of emerging skills. Occupational therapy, physical therapy, social work and nursing also available if need is determined. Socialization with non-disabled peers through activities, center-wide functions, and outside play. These classrooms provide a challenging environment with supportive teachers who understand and facilitate the learning process in social, emotional, physical and cognitive development. A child-centered curriculum built upon observing and understanding each child's individual skill and interest level allows for each child's unique pattern and pace of growth, personality, learning style and family background. For children 3 to 5 years old with or without special needs. Taught by special education teacher and early childhood teacher with assistant; speech therapist also provides support. Parents encouraged to be part of center-wide activities and training programs. Speech therapy, occupational therapy, physical therapy, social work, and other support services are available when need is determined. Stepping Stones Learning Center's (SSLC) vision is "to be the advocate and leader in the development of inclusionary services for all children of all ages and backgrounds through the design of programs that meet the child's ever changing needs." This vision has driven us to grow as an organization and to build increased numbers of collaborative relationships in the community. Below is a listing of sites where SSLC provides classroom and clinic services. SSLC's Hudson Ave is the organization's main site and houses nine early childhood classrooms and four clinic spaces. Multidisciplinary Evaluations are also conducted at this site.